An Instagram post Tuesday night led to some renewed speculation about Chancellor's future. Time for another round of Seahawks questions and answers. Q: What’s up with Kam Chancellor’s Instagram post in which he posted some video of his Seahawks playing days and wrote “Fight till you cant fight anymore!!! !’’ with the hashtag #StayTuned. Does that mean he’s coming back sometime soon? A: To quickly answer the last part of that question, no. Recall that he was placed on the Reserve/Physically Unable to Perform list when training camp began. And per NFL rules, that means he is ineligible to play in 2018. There may be some confusion because there are two PUP lists — reserve and active. If you are placed on the active PUP list, as defensive end Dion Jordan was, then you count against the 90-man training camp roster but you can also then return either for the beginning of the regular season, or if you remain on the PUP list when the regular season begins, after six weeks. Players on the reserve list, as noted, do not count against the 90-man roster but then also cannot return during the season. Chancellor is on that list due to a neck injury he suffered last Nov. 9 against Arizona. The Seahawks are basically forced to keep Chancellor on their roster (but not the active 90-man roster) because they owe him injury guarantees of $6.8 million this season and $5.2 million next season. They could release him, but the salary cap situation means Seattle is better off hanging on to Chancellor for now. Also, the injury guarantees are why Chancellor has not officially retired, even if he wrote via social media on July 1 that he would not be able to play again. If he were to officially retire then he would lose out on the injury guarantee money. So Chancellor is done for 2018. But what if Chancellor were to pass a physical in 2019 and want to play? Well, there’s where things might get dicey. If Chancellor did pass a physical then the Seahawks would almost certainly release him so that they wouldn’t have to pay his $10 million base salary in 2019. The injury guarantee portion of $5.2 million becomes guaranteed if he is on the roster the week after the Super Bowl. Former NFL agent Joel Corry, who writes about salary cap issues for CBSSports.com, said recently that’s Seattle’s best-case scenario when it comes to Chancellor. “You’re better off having him (on the roster) in 2018 and see if he can pass a physical next year and then you would not be responsible for the $5.2 million and could cut him next year,’’ Corry said. Given Chancellor’s health, the Seahawks almost certainly wouldn’t take the chance of keeping him on the roster and having him potentially get hurt again and owing him all that money. So, sad to say, but regardless of whatever hints may get dropped via social media, it’s sorta hard to envision realistic scenarios where he plays for the Seahawks again. Q: What’s the receiver rotation going to look like with Doug Baldwin almost certainly out this week and maybe for a few more? A: Baldwin, as noted, figures to be sidelined for a few weeks with a sprained MCL suffered in the first quarter of Sunday’s loss at Denver. 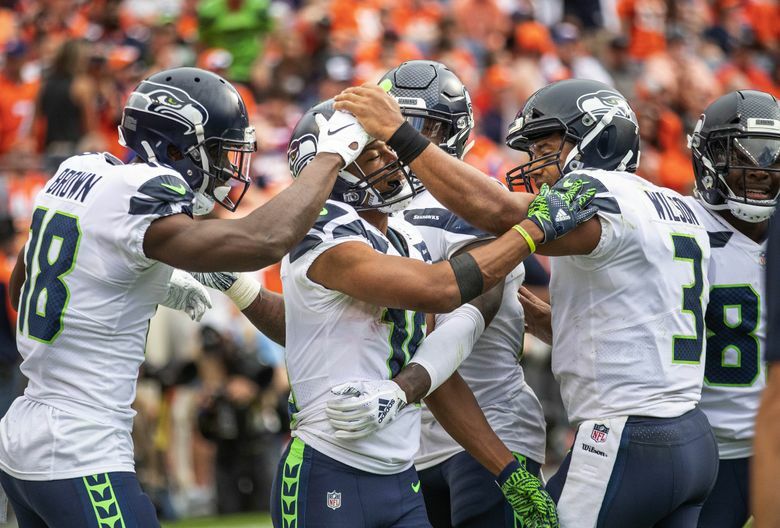 Baldwin played just 11 snaps against the Broncos and you saw Seattle adjust in a way that makes sense for the Seahawks to continue to adjust the next few weeks – using Tyler Lockett in the slot more, with Brandon Marshall and Jaron Brown outside. Pro Football Focus noted that Lockett ran 15 of his 21 routes from the slot after Baldwin was injured. You’d imagine the Seahawks would likely leave Lockett in the slot primarily for now, with the bigger Marshall and Brown on the outside. Seattle also signed Keenan Reynolds off the practice squad and he can play in the slot as well — that was his primary position in the preseason. But I doubt they’d rush him into a significant role right off the bat. Seattle’s only other receiver on the active roster is David Moore and he’ll likely see more playing time than the 16 snaps he got last week. And it was no doubt interesting that coach Pete Carroll said Tuesday the Seahawks could also consider using running back C.J. Prosise — who was a receiver for two years at Notre Dame — more in receiving roles in Baldwin’s absence. Prosise had been ticketed mostly for the two-minute/third-down back role. But he played just seven snaps last week against Denver, almost all on the ill-fated final series, with Chris Carson and Rashaad Penny splitting the other 50 — each got 25. Using Prosise more as a receiver might allow for the Seahawks to more clearly define the roles of Carson and Penny as well, using Carson more as the early-down back and Penny in third-down roles, and then maybe also activating Mike Davis to serve as a third running back. Q: Russell Wilson played a very uncharacteristic game Sunday. He didn’t escape pressure very well, only took off running once, and was completely ineffective in the fourth quarter (outside of that one play.) I was really baffled by it. Do you think that’s a product of the new scheme? Did Denver have just have a brilliant game plan? Or was it simply a rusty first game by Russell? A: The more I look back at it, one thing I think we all underrated the minute the game ended was the impact of losing Doug Baldwin. He is really Wilson’s security blanket receiver, and especially on third downs — where Seattle was only 2-for-12 — I think that was an increasing issue as the game wore on. So that’s one thing. The bad news there, as discussed above, is that Baldwin may miss a few weeks so the Seahawks will have to figure out how to convert third downs without him for a little while. His first game in a newish system — recall that Brian Schottenheimer said 70 percent of what they run now is the same as what they ran before — may also have played a role. Wilson has also often needed a game to get into regular season form. He had above-average outings in 2013 and 2014 but from 2015-17 he was a combined 72-111 for 667 yards, two touchdowns and two interceptions in openers, a passer rating of 79.67, with 97 yards rushing on 13 attempts. Wilson was hardly awful — he had a passer rating of 92.7, and his yards per completion of 9.0 is more than good enough. And while six sacks is too many, and Wilson took the blame for three of them, it is worth noting that three came on third downs and two when he was trying to extend plays. As Wilson himself noted, on third downs more than any other, you’re trying to make something happen since a punt is going to come next, anyway. The Seahawks hired Schottenheimer in part to try to smooth out some of the rough edges in Wilson’s game that emerged over the past few years and keep him on-script more. Maybe he’s still adjusting to that balancing act. The change in offensive coaches has led to some speculation that Seattle doesn’t want Wilson running at all, but that’s not the case, as Carroll reiterated Tuesday. No doubt, Seattle needs Wilson to play better. But if his track record means anything, then he will sooner rather than later. Q: What is the adjustment the team makes for a MNF game assuming it is a change in routine? A: They basically just move everything back a day. That was why Carroll spoke to the media on Tuesday instead of Monday. Tuesday was like their Monday this week, then Wednesday like Tuesday, etc. So that means their two big practice days of the week this week are Thursday and Friday. Then they will have a lighter practice on Saturday and then fly to Chicago. Since the game is more than one time zone away they are leaving two days before the game instead of just the day before. That will make things trickier next week, though. But at least they are at home next week so there is no travel. They will fly back to Seattle immediately after the game against the Bears, likely take Tuesday off and start their regular practice week on Wednesday. That said, off days are rarely totally off. Guys who need treatment will go in for that and lots of guys will go watch film and whatever else.